Original Harry Carey Ranch house, gate and fence; the latter were apparently made from sycamore branches found in the canyon. This is the house where Harry Carey Jr. (Dobe) was born in 1921 and Ella (Cappy) in 1923, to actors Harry Carey (Sr.) and the former Miss Olive Golden. 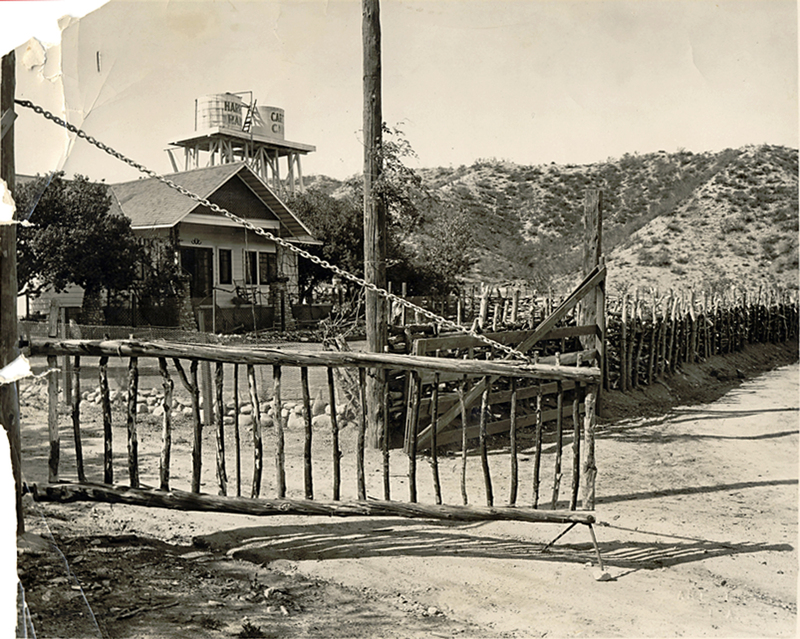 The house survived the flood that resulted from the collapse of the St. Francis Dam in 1928, only to burn to the ground in 1932 when a ranch hand took a lantern into a shed to get some gas to fill a pump engine. The lantern caused the gas tank to explode, and the fire quickly spread to the house. The Careys replaced the house with an adobe ranch-style home which today is the centerpiece of the Tesoro Adobe Historic Park in the Tesoro Del Valle subdivision. DC2206: 9600 dpi jpeg from original print courtesy of Harry Carey Jr.